The first fictional reference to sleep teaching. The idea that people could learn while asleep was a source of continuing fascination to people in the early 20th century. 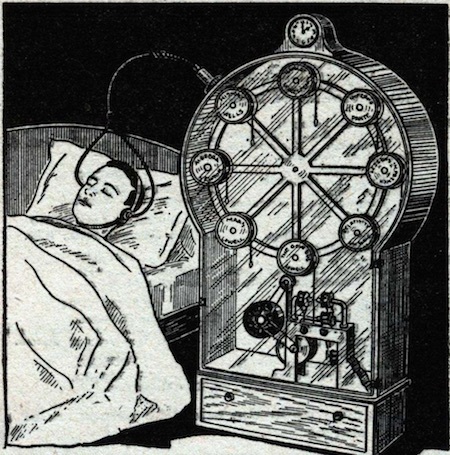 It remained to Ralph, however, to perfect the Hypnobioscope, which transmitted words direct to the sleeping brain, in such a manner that everything could be remembered in detail the next morning. This was made possible by having the impulses act directly and steadily on the brain. For thousands of years humanity had wasted half of its life during sleep - the negative life. The first use of this idea outside science fiction was apparently the invention of the "Psycho-Phone" by In 1927 by Alois Benjamin Saliger . He asserted that "It has been proven that natural sleep is identical with hypnotic sleep and that during natural sleep the unconscious mind is most receptive to suggestions." Modern research indicates that "sleep teaching" doesn't really work. 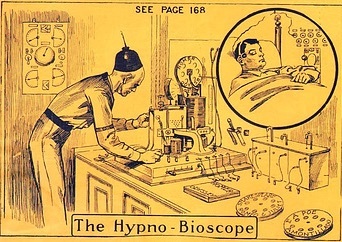 Unlike the devices used to present information to the brain by the roundabout method of playing it out loud and then entering through the ears, the hypnobioscope acts directly on the brain itself. Compare to hypnopaedia from Aldous Huxley's 1932 novel Brave New World and the toposcope from Cities in Flight (1955) by James Blish.